Using the sun to power consumer electronics is horribly inefficient and expensive but as technology advances, the process gets a lot better. PCs are running in 5W now compared to over 10W just 5 years ago. Screen technology is getting more efficient and the solar equipment used to collect and store the energy from the sun is getting better. Solar panels are still expensive and inefficient but Changers have put together a solution that’s intelligent, easy, fun and not too expensive. It doesn’t quite deliver what it should and it’s not up to powering any sort of PC solution but it’s fun and easy to use for smartphone-like charging operations. In theory you’ll be able to load the 16.5Wh battery pack in 4 hours but in practice it’s a little different. More about that in a bit. There’s a second aspect to the Changers way and that’s community. The charger also serves as a data logger and as you load and use the energy on your charger it collects the data. That data can be uploaded to the Changers community where your profile is credited with Wh generated and C02 savings. Each Wh counts towards a credit and that credit can be used against green-purchases in the Changers store. The fun aspect comes by watching your credits grow and of course the competition with other users around the world or, more fairly, in your town. 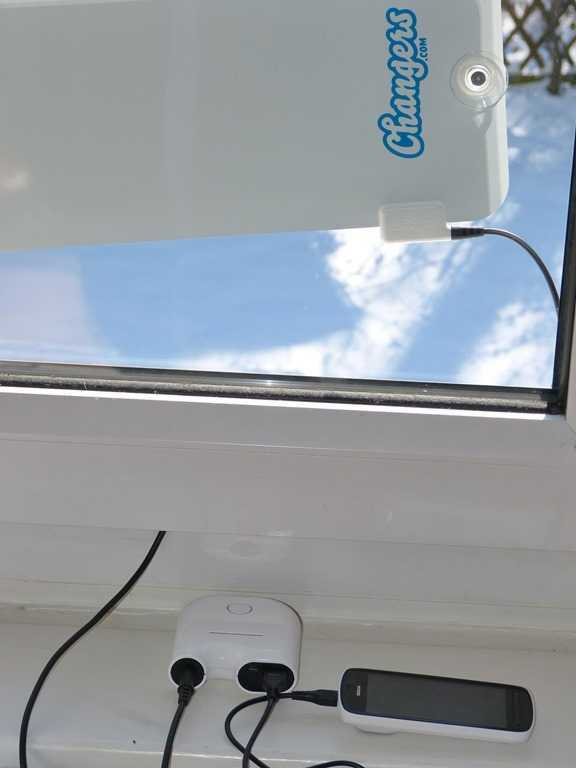 The solar charger can store 16.5Wh of energy which is enough for a couple of standard smartphone charges and a little bit left over for emergencies. 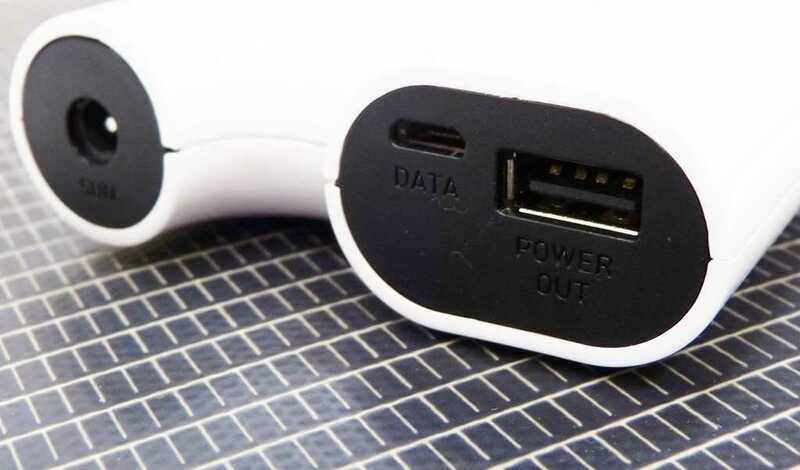 The charger offers 5V at a max 1.2A which is more than the standard USB port can deliver but short of the power that many fast-chargers have to charge tablets. (2.0A.) You can find smaller power units with bigger capacity but Kalhuohfummi is still a practical size, especially considering its features. As for charging rate, you’ll need to be aware of one rule of thumb. For middle-European summers, don’t expect more than 4 hours of usable sun per day and even on a very very hot day, haze can affect efficiency. A local weather station gave me this sun report today. The 4W panel should be outputting at its max so to test that I’ve done too things. 1 – I’m measuring 1 hour of load using the data logger which will tell me how much I’ve stored. 2 – I’m watching some blinking lights. At the sun / temp levels shown above I saw a constant 2 blinks/second which indicates 2-3W of charge. It’s slightly short of what the panel could deliver but these lights are only an indicator. After 60 minutes the charger uploaded a recorded 1.1Wh to the Changers website which is quite disappointing. At least double that value was expected but when we continued charging for another 20 minutes we recorded another 2.5W of charge on the Changers website. In total, 3.6Wh in 80 minutes. Tip: Try not to put the panel on the inside of a window – the losses are huge. SolarUMPC.com is focused on powering PCs from the sun and unfortunately the Changers solar kit doesn’t sit comfortably in that territory. Earlier this year I tested a Windows 8 touchscren hybrid PC that could charge over a micro USB port. It required 2A to charge quickly but using a standard USB-style power pack I was able to trickle enough energy into the Lenovo Lynx to keep the power level while I was using it and the changers solar kit could fit well into that scenario. Ideally though, Changers would take their technology and build a charger that could take one two or four Changers solar panels (I’d like to connect my 25W panel if possible) and store 50Wh or more of energy while offering a 2.0A output. The Changers Solar kit shows that despite stagnant solar panel technology, there are other ways to improve efficiency through variable charging. 150 Euro for a 4W/16Wh solar charging system is expensive though. We’ve seen 15W/80Wh systems for the same price but they’re not portable. 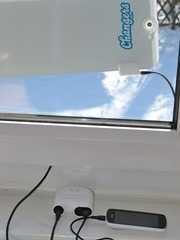 In our well-oriented, full-sun tests we saw a 3.6W of energy being captured in 80 minutes (2.7W over an hour) which is acceptable but in practical terms would mean a couple of days in the sun before a full 16.5Wh charge was achieved – just fast enough to keep up with the demands of a smartphone. 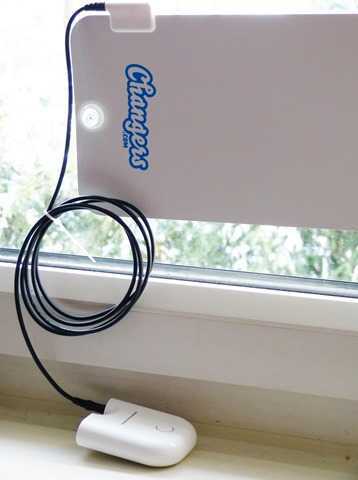 Let’s hope Changers consider a larger system for the future but in the meantime, the current Changers system is recommended for those wanting some solar fun and free smartphone power. My changers profile page is here. Changers are on Facebook here. More information on the products here. You recommend to not put the panel on the inside of the window. But is the solar panel water resistant or weather proof? Yes, panel is OK outside, charger is not.